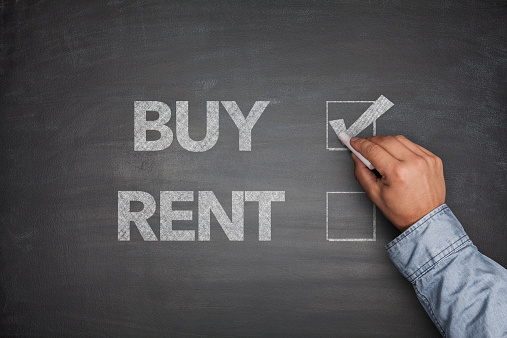 Why Should I Own Instead of Rent? Affordable mortgage rates and rising rent costs have led many people to consider home ownership for the first time. Before you make the life-changing choice of purchasing a home, make sure you’re informed about the benefits of that decision. You can build equity. When you buy instead of rent, you are increasing the degree of ownership with each payment you make. If you intend to stay someplace for at least five years, the cost of buying a home is more likely to be offset by both equity and increased home value. Eventually, you may even be able to borrow against the equity you have in your home. Your housing payment will stay stable. Unlike rent, which can change each year, a fixed-rate mortgage allows you to have the same principal and interest payments throughout the duration of the loan. Even if property taxes change, those things will not. You can take advantage of tax deductions. In many cases mortgage interest, property taxes and even private mortgage insurance can be deducted from your taxes. You may also qualify for first-time home-buyer credits which could further reduce your taxes or increase your refund. You have complete creative freedom in your space. One of the best things about owning versus renting is that you can change your space to suit your needs and your specific tastes. You want a blue accent wall? Great, pick any wall you’d like. You want a space to relax in the summertime? Go ahead and add on a patio. The sky’s the limit. The bottom line is that buying beats renting on many counts. For first time home-buyers who are excited to take the plunge and begin the search for their first home, Howard Hanna created the “My First Home” program. We believe in the American Dream of Home Ownership for everyone, and this program makes purchasing a first home easier than ever. It helps to reduce closing costs by wrapping them into the loans and even offers down payment options such as 3.5% with reasonable credit. Learn more about starting the search for your dream home.